Jo Ann Turovsky is principal harpist with the Los Angeles Chamber Orchestra, the Los Angeles Opera Orchestra, the Long Beach and Pasadena symphonies, and is a member of the contemporary music ensemble XTET. She has been the professor of harp at the Thornton School of Music at the University of Southern California for the past 20 years. She is also on the faculty of the Colburn School of Performing Arts. Turovsky has won numerous awards for both her solo and chamber repertoire interpretations. These include the first prize in the American Harp Society National Competition, Young Professional Division; first prize in the Coleman Competition for Chamber Music; prize winner at the Fifth International Harp Competition in Jerusalem, Israel; and numerous local awards from Mu Phi Epsilon, Sigma Alpha Iota, the Etude Music Club and the Young Musicians Foundation. 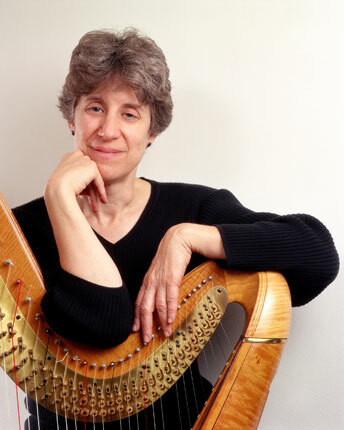 Turovsky is Chairman of the American Harp Society National Competition. She appears frequently as soloist with musical organizations throughout California and is busy in the motion picture and television industry. John Williams recently wrote a solo piece for her that was featured on the Angela’s Ashes sound track. Her spare time is happily devoted to her cat and two border collies.